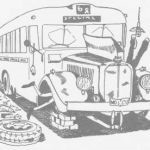 ATDB • View topic - DGT buses in the 50's and 60's. DGT buses in the 50's and 60's. Some of the photos i took of Department of Government Transport buses in the 1950's and 60's. Leyland Worldmaster m/o 3334 is at St. Leonards in this photo and it had just been newly overhauled and painted. It had only just been released to traffic duties by the mechanical staff at Willoughby Depot and i grabbed it to use as a staff bus to pick up my run at St.Leonards. Route 204 from Martin Place to Bonds Corner Northbridge was more or less a peak hour service only and did not see many services. Leyland OPD2 m/o 2491 is at the terminus in this shot. Talking of Castlecrag, here we see m/o 2495 at the Castlecrag Terminus. Leyland OPD2 m/o2493 on a route 203 journey to Castlecrag is on Eastern Valley Way on the border between Willoughby and Castlecrag. Wouldn't our safety experts have heart seizure today to see school children standing on an open platform of a moving bus especially as it is about to make a sharp right hand turn into Edinburgh Road. If you look closely at the bus there are a few things not exactly correct as the front off side headlight has been accident damaged and also a no no as far as the DGT authorities were concerned is that the conductor has his head into the drivers cab talking to the driver. Brookvale Prewar Albion Venturer m/o 1624 in the confines of the depot. The photo gives a good shot of the Gardner 6LW motor that powered the latter part of the order whilst the earlier build of this order were provided with an Albion engine. Willoughby Leyland TD5 m/o 1645 in Willoughby Rd. Willoughby in Sept.1960. As can be seen tram track removal was in full swing at this time, Ihave a connection to 1645 as it was the only prewar bus i worked on as a conductor as there were only 3 left at the depot at the time. Willoughby Leyland TD5 m/o 1568 is seen in Victoria Ave. East Chatswood in this 9/3/60 shot. It was a late overhaul for a prewar bus as evidenced by its destination box being reduced by rebuilding for the smaller front destination rolls. Leyland OPD2 m/o 2337 at Merewether Beach Tram Terminus on a tour of the former Newcastle tram lines on 29/11/59. The tram destination box was definetely not a normal part of the OPD2's kit. Up till the 1960's the toll booths on the Sydney Harbour Bridge had a roof over them which required vehicles to pass under them. Most were low roofed which allowed cars or small vehicles to pass under but there were a few which allowed double deck buses and larger vehicles to traverse through. Evidently the driver of Brookvale Albion m/o 2099 got his tall and short roof mixed up and this was the result. It was a bit chilling to see this bus up close as some passengers on the bus at the time had been seriously injured and there were blood streaks running down the outside body works from the top deck. Ironically this photo was taken at North Sydney Depot on the 23/2/58 when, with a whole lot of other tram enthusiasts, we were waiting in the Waterhole Sidings at the tram depot to begin a tram tour on D class 116 and this bus was driven in beside us having just left the accident scene. The Nth. Sydney tram System was only four months away from closing at this stage. Leyland TD5 m/o 1427 is in Newcastle in this 28/4/60 photo. It is one of the small number of prewar buses to have a pressed metal front number plate as most had their redgo number hand painted instead ( check out the photos of 1568, 1624 and 1645 in this post to see how they were normally displayed). Last edited by Red and Cream on Fri Aug 31, 2018 12:39 pm, edited 3 times in total. Re: DGT buses in the 50's and 60's. Great to see 'Red and Cream' back again, it's been a while. Always fantastic photo's to share. And dare I say, I think I've spotted a Globite school bag ! Centralian wrote: Great to see 'Red and Cream' back again, it's been a while. Thanks Centralian, yes a signature "Globite" but you have not been observant enough, as it's bags in the plural. Some very historic high quality shots. Very generous of you to put them up here. I enjoyed the read as well. That building behind the Worldmaster is just as fascinating as the bus. It looks like it wasn't built much long before the bus either. If that bus had been overhauled, it must have been taken in the mid to late 60s. Thank you so much Red & Cream for these brilliant shots and amazing memories! Confused by the photo of TD5 1645 in Willoughby Rd,Willoughby with the Foden behind it. The photo appears to show the tram lines turning right into Mowbray Rd, however I thought they went left into Mowbray then right into Penshurst St. Any thoughts ? P.S. _ fantastic photo's Red & Cream ! Harris St (seen on the sign) is somewhat south of Mowbray Rd. It is just a kink in Willoughby Rd, not a turn. I think the Foden truck could be one of Athur Gillott's, of St Ives Bus Service fame. Yes, that now makes sense Boronia. Another question, why is the 271 running 'Special' at this point when they normally turned left into Penkivel St., just north of the photo,then right into Penshurst St. to finish their run. 60 years on, it is hard to guess why it is SPECIAL, but by my calculations the bus has not reached Penkivil St, which starts at the bottom r/h corner of the photo, past the servo site. That's correct Boronia. They turned left just after that point into Penkivel St. then right into Penshurst St. before terminating at the corner of Penshurst St and Mowbray Rd. Thanks for your comments about the post guys. Reo wrote: Yes, that now makes sense Boronia. Another question, why is the 271 running 'Special' at this point when they normally turned left into Penkivel St., just north of the photo,then right into Penshurst St. to finish their run. I think it was just returning from Wynyard after the morning peak and running special to the depot. In those days the route number 000 was not used when running special and just displayed the last run taken by the bus. The only time the 000 was used was when a bus was returning from Chullora Workshops as shown in the photo of m/o3334 which is in the state it was received back from there. Regarding the spot where the photo m/o 1645 was taken this shot may give a better perspective as the picture i posted was cropped from it. Tramline removal Willoughby Road Willoughby 27/9/ 1960. Some photos of the tramtrack removal. Great crime scene pics R&C, while its taking place!! Thanks Red and Cream...your explanation sounds very plausible. Of an evening they would normally run a 274 back to the depot via Forsyth and High Sts. Swift wrote: Great crime scene pics R&C, while its taking place!! Yes Swift, you certainly wouldn't need CSI Miami to gather the evidence as they have been caught in the act however the Statute of Limitations for a conviction has really been exceeded!!!!!!!!!!!!. In the photo of the accident damaged Albion i described a few things that might have been a bit obscure to the younger viewers and i have posted these pics to better explain them. 1. The Waterhole at North Sydney Tram Depot was the outside storage sidings for the depot and mainly housed the O type cars Whilst the shed with covered tracks housed most of the later corridor trams. 2. The tram tour we were waiting to join when the accident damaged bus arrived. This was the D class tram we used on that tour. D class 116 on the Harbour Bridge during tour 23/2/58. 3. The Low and the high roofs over the toll booths on the Harbour Bridge at the time of the accident. This photo is not mine but i thank Pinterest/ National Museum of Australia for the inclusion of this unknown photographers shot. The toll booths where the 14 foot 4 inch high bus tried to fit under the sign posted 11 foot roof. Unknown Photographer/ Pinterest /National Museum of Australia Photo. Is that the imperial royal supporters (lion and unicorn -- from the coat of arms) atop the toll booths? Looks more like a dragon and a unicorn? I've never seen anything like it.